These 1,2, 3, or 4 piece spill containment units provides safe and secure indoor/outdoor storage for your 55-gallon drums. Simply use your forklift and/or drum handling equipment to lift and lower the drum into the bottom sump, then place the top portion over the drum where it locks in place onto the lower sump portion. Convenient "roll top" cover or Swing Lift slides up and out of the way�allows quick access to drum pumps and funnels. Lightweight, yet rugged upper body is easily removed to load or unload drums. Tall head space (25 3/4") allows use with drum pumps and conical funnels. 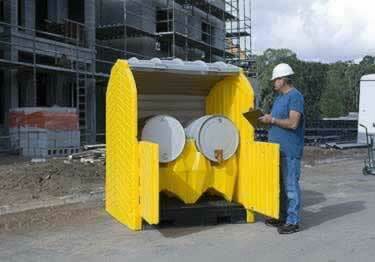 Lockable design provides added security for storage of hazardous materials. Optional dolly offers safe and efficient material handling. To safely and securly store your 55-gallon drums. 100% polyethylene construction will not rust or corrode. I am looking to purchase the Hard Top P2, with Drain-Swing Lift and was wondering if there is anyway to secure the platform to the deck, and how water tight is the container. Safe and secure indoor and outdoor drum storage containers for 55-gallon drums. Provides complete protection from outdoor elements. Easy to assemble. Available for 1, 2, 3, or 4 drum containment.